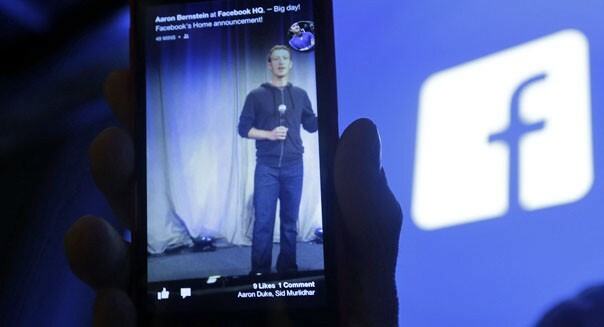 Marcio Jose Sanchez/AP Facebook CEO Mark Zuckerberg, as seen on an HTC First smartphone using the new Facebook 'Home' interface. Making you feel comfortable didn't get Facebook to a billion users. It had to push your limits of "open and connectedness." That's why so many of its product launches are initially met with outrage, or apprehension. But Zuck is convinced the amount we share will double each year. So if you don't want "Home" yet, fine. It's designed to handle how we share in 2016 so no one steals Facebook's future. "If you asked people what they want, they would have said faster horses," Henry Ford supposedly said about building the car. That's because our minds think incrementally. Mark Zuckerberg is thinking exponentially. That's made him a pariah in the short-term, but one of the world's most influential people nine years after he started Facebook Inc. (FB). On April 4, 2013 Home was introduced as the next version of Facebook. Home turns an Android phone into a more manageable social experience, rather than a collection of separate apps that can be tedious to navigate through. Home will be available free from the Google Play Store starting April 12 and will also be pre-installed on phones through the Facebook Home Program. "From the moment you wake up your phone you become immersed in cover feed. Cover feed replaces the lock screen and home screen. It's a window into what's happening with your friends - friends finishing a bike race, your family sharing a meal or an article about your favorite sports team. These are the beautiful, immersive experiences that you get through Home." "You might have missed these updates before, but now they're a central part of the Home experience. Since Home is both your lock screen and home screen, the content comes right to you. You can flip through to see more stories, and double tap to like what you see. Cover feed is for those in-between moments ­like waiting in line at the grocery store or between classes ­when you want to see what's going on in your world." "With chat heads you can keep chatting with friends even when you're using other apps. When friends send you messages, a chat head appears with your friend's face, so you see exactly who you're chatting with. Messages reach you no matter what you're doing - whether you're checking email, browsing the web, or listening to music. You can move chat heads around and respond to messages. And since SMS is integrated into Facebook Messenger for Android, chat heads include Facebook messages as well as texts." "Cover feed is great for seeing everything going on in the world. But when something happens that's more important and directed at you, like a friend posting on your timeline, you'll receive notifications with their profile pictures. To open notifications, just tap them. And if you don't want to deal with them right now, you can just swipe to hide them and keep flipping through cover feed until you want them back." "It's as easy to get to your apps in Home as it is on any other phone. Swipe up to see your favorite apps in the launcher. There's also a screen containing all of your apps, and you can drag your favorite apps to the launcher."